Hello & welcome to the decade of my birth. I know I’m bias, but I sure do love the 90s. From magazine ads and photos clipped and tacked on my wall to my Walkman skipping on the bus ride home to my Lisa Frank notebook filled with cursive and multiplication problems. So hella cool. The Harry Potter series is set in the 90s. Maybe that’s why it’s so amazing and wildly successful 😉 Just kidding. Kind of. But obviously this series ends up on my recommendation list. 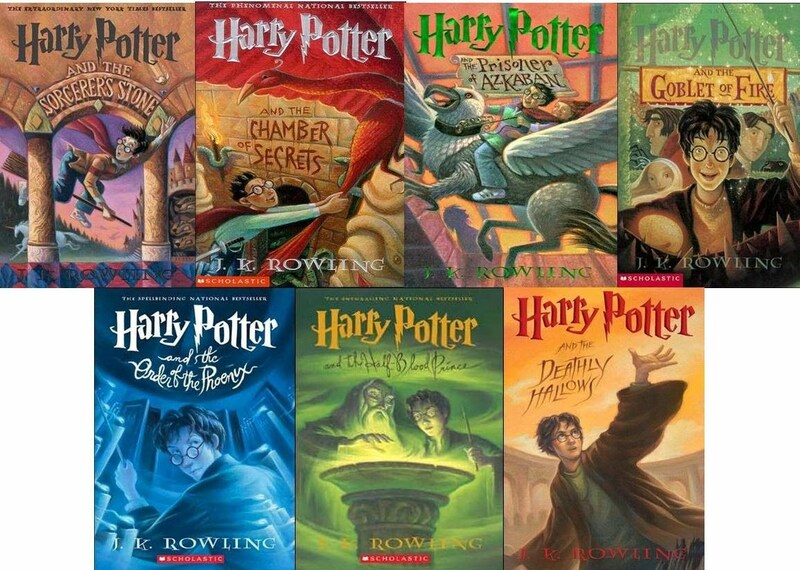 The Battle of Hogwarts was in May 1998 so the six books preceding Deathly Hallows all occur in the six years prior. Once again, Harry Potter is at the top of my list. (1991-1998) I am very passionate about the book > movie debate. And I don’t think that HP is an exception necessarily, but I will say that the movies possess a magic all their own, and the music and acting that accompany them are beautiful and amazing. So if you’re a staunch HP book lover and adamantly against the movies, give them a shot. (1991) If you’ve ever questioned my love for Robin William’s acting then question it no more. Hook is one of two RW films on my list 🙂 If you didn’t just holler “RUUUUFIIIIOOOOO” in your head then you need to watch it again. I love how the old story of Peter Pan is brought to life. (1995) I have one R movie on my list… I haven’t seen it in a long time and I probably won’t ever watch it start to finish again, but the movie Se7en is a series mind-twist. It’s violent and vulgar and 100% not my kind of thing, but I remember loving the story line when I first saw it. If crimes films (and 1990s Brad Pitt 😍) ARE your thing, you should watch this. (1995) Has everyone seen the original Jumanji movie? Not the one with Kevin Hart and The Rock. I’m talking about the classic with Robert Williams and Bonnie Hunt and Kirsten Dunst. SO GOOD. I could do without the spider and mosquito scenes, but I just cover my eyes 🙂 For being a fun kids movie it makes me whole body shake with anxiety every time they roll the dice. (1999) I absolutely love the movie 10 Things I Hate About You. I think Julia Stiles is amazing and obviously Heath Ledger is crazy adorable. And Joseph Gordon-Levitt is cute, too! It’s a loose retelling of Shakespeare’s The Taming of the Shrew & the late 90s fashion is on point. 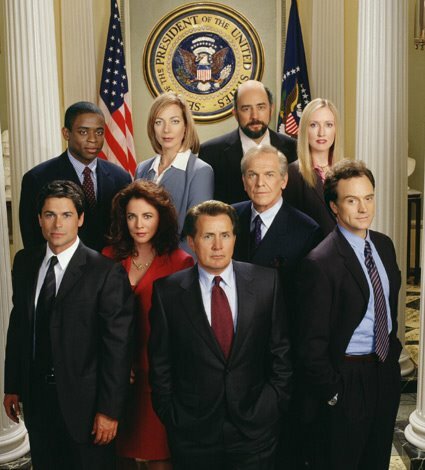 The West Wing kicked off in 1999. Honestly, I think everyone should watch this series. Besides the actors being incredible, the stories are so humbling and intriguing and timely. Go check out what Alexandra recommended from the 1990s! Next month is our last month of recommendations! (HOW are we at the end already?!) We are diving head first into the first decade of the 2000s. The threat of global warming loomed larger, the War on Terror was born, and the world became obsessed with superhero films. Join us for a blast from the most recent decade. Oh love the 90s! Hook, Seven and 10 Things I Hate About You were such great movies! Completely agree!! I always watch 10 Things… whenever I see it on TV! I do need to watch Hook again… not because I didn’t shout “RUUUUFIIIIOOOOO” in my head, just because it’s been way too long since I’ve seen it. I LOVE 10 Things I Hate About You. Actually, there were a lot of good films in the 90s… but I feel the need to mention all the Jay and Silent Bob Films (up to Dogma, obviously… the ones after that came out in the 2000s). Kevin Smith is one of my favourite people. It’s been a long time since I’ve seen Hook, too. I’ve never seen a Jay and Silent Bob film! My husband used to make references to Dogma all the time, though! I love Notting Hill and the First Wives Club! Notting Hill is so so cute!! I was obsessed with the original Jumanji! So good. We even had the board game! Can we talk about boy bands tho?! Oh man, I’d honestly be wayyy too scared to play the board game Jumanji! Ha! Oh boy bands! 🙂 I was a BSB girl- totally against N’SYNC! Your college age cousin will probably thank you forever and ever 🙂 Don’t forget some of the 2000 gems like She’s All That! Yes, the 90’s!! I was born in 1990 so I love this decade too. I’m so with you on the Harry Potter books AND movies. And 10 Things I Hate About You. So adorable. Okay, I thought I was the only person who loved Hook! I watch every time I see it on cable. Now it does make me a bit sad, since the passing of Robin Williams but it’s still so dang good! And I also adored 10 Things I Hate about You, especially the scene where Heath Ledger serenades Julia Stiles with the marching band playing. And now I feel sad again because Heath is also no longer with us. I enjoy both HP books and movies, although I like the books a bit more because more details and Ginny is obviously far better in the books but I don’t hate the movies. I must confess, though, I really never paid attention to the dates so I didn’t realize that they were set in the 90s! 90s music is also my favorite, although we have different musical tastes – I liked pop (yes, I rocked Britney, Christina, Backstreet Boys, JLo) and rap (so yup to Eminem, Dr. Dre, Tupac,, etc). Ughhh. I hate that Robin Williams and Heath Ledger are not longer around. Inner demons go after the brightest stars sometimes. Book HP is definitely better. I just enjoy the actors and music from the movies. I love that us 90s kids get to lay claim to the setting. Hahahaha. RUFIO – RUFIO … I still adore Hook myself. & still get sad about Robin Williams. It’s crazy to think HP came out in the 90’s – when I was a full fledged adult … & I STILL was one of those people in lines at midnight for the next book. Good times. I get SO sad about Robin Williams. It’s the only downside to his movies now. I love that so many people grew up with HP, all at different stages in life! Wait… you’ve never seen The First Wives Club?!?! OMG it is one of THE best 90s movies ever! I have it, I love it, I watch it often! Empire Records is good too, also have that. I agree with all you movie choices, though I’ve never seen Notting Hill. No!! That’s terrible, right?? I will fix it asap! I just watched Empire Records this week. Definitely lives up to the hype everyone talks about! I also need to know your thoughts on this! It was cute! Very teen-cult classic 🙂 I really loved the forgiving family atmosphere that was present in the record store. No one was perfect but that was ok- because they were all humans and they made mistakes and they could recover from those mistakes and move on to better things. I loved that! OMG 10 Things I Hate About You was one of my favorite movies in high school! It was so good! 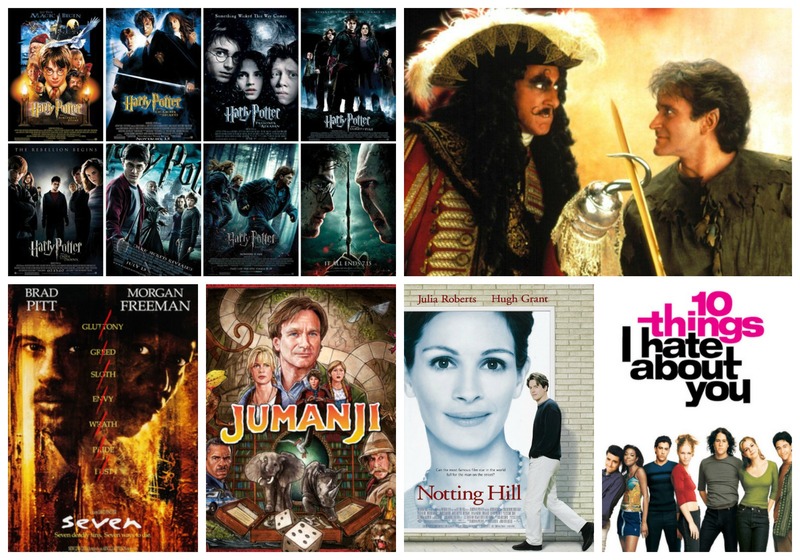 And you seriously can’t go wrong with Notting Hill or Harry Potter! My husband’s cousin has been on us to watch West Wing for yearsssss. He brings it up everytime we see him! One day we will actually watch it! Oh my gosh, WATCH IT. First of all, it’s very entertaining and good (and the cast is cute). But also, it helped me understand government and politics a little better. It’s still a TV show, but it’s very well researched. 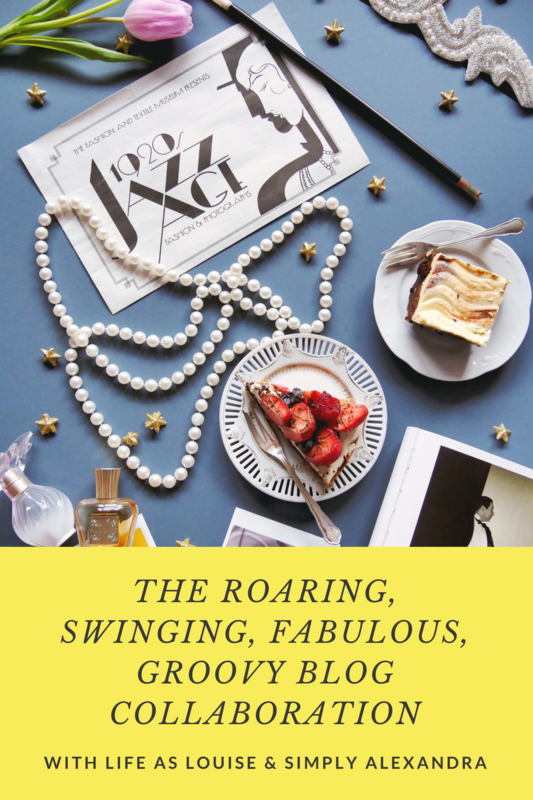 I was so excited to write the 90s post! 90s Brad Pitt is the BEST Brad Pitt. So dang cute! I just watched Empire Records this week (right after this post went live)! I loved it! The 90s just produced some *really* good stuff! Hook is such a classic. And the fact that HP is set in the 90s makes it that. much. better.! !